This page is designed to serve as a place for Anthropology faculty and instructors to obtain instructional support. Once the form is submitted, the request requires Department approval and approval from the academic senate. See: Course Approval Workflow. Please submit requests 6+ months prior to the quarter you plan to teach the course. The Anthropology Department reaches out to faculty for course offerings and time preferences. Teaching time preferences are then proposed to the campus scheduling office which oversees scheduling requests for the entire campus and places the courses. Request for Fall teaching times sent out January. Request for Winter teaching times sent out June. Request for Spring teaching times sent out August/September. Call for Summer proposals sent out October. Faculty must submit at least one MWF time preference for each quarter. Courses requested for standard teaching times will be assigned to classrooms first. Classroom Details - Learn more about the capacity and features of each classroom. To check the availablity, please check the room calendars. To reserve one of these rooms please email dekelly@ucsd.edu. We will contact the registrar's office on your behalf to reserve space on campus. Students requesting accommodations for this course due to a disability must provide a current Authorization for Accommodation (AFA) letter issued by the Office for Students with Disabilities (OSD) which is located in University Center 202 behind Center Hall. Students are required to present their AFA letters to Faculty (please make arrangements to contact me privately) and to the OSD Liaison at the Global Health Program in advance so that accommodations may be arranged. Statement on Attendance: What are acceptable/unacceptable reasons for missing class? What should a student do if they have to miss class? What are the consequences of an unexcused absence? Late Papers or Missed Exams: What should a student do if a paper will be late or if an exam will be missed? What are the consequences? Please follow the link to find out how to file a complaint of alleged student misconduct (non-academic). All standard UC San Diego courses will automatically have a TritonEd site at the start of each quarter. Instructors will be notified via email prior to the quarter beginning. By default, all TritonEd sites are hidden from students until the instructor has made the site available. You will need to activate your TED site here. Give Access to your TA's. For more information, contact edtech@ucsd.edu or call (858) 822-3315. Academic Computing and Media Services (ACMS), is responsible for technology in general campus classrooms and lecture halls, including help with media stations, projectors, document cameras, and other instructional classroom technology. ACMS staff can also provide in-person orientation sessions to familiarize new users with the equipment. Email classroom-support@ucsd.edu for information or issues that do not require immediate assistance. Call (858) 534-5784 for immediate technical support. Visit the Classroom Details page to find the technology and media available in every classroom and lecture hall. Also find information about each room's seating capacity, lighting, and more. Download the i>clicker software supported at UC San Diego. In order to assure that clickers and books are on the shelves for the first day of class, instructors must to place an order with the UC San Diego Bookstore no later than 1 to 2 weeks prior to the beginning of each quarter. Same day requests can be accomodated, depending on stock at hand. Clickers are available adjacent to the textbook info counter. Students may sell their used clicker back to the Bookstore if that clicker will be used the following quarter and if the Bookstore needs extra devices. We suggest that you put clear instructions in your syllabus about a deadline for registering their clickers and an explanation of how to do this. If you are using TritonEd, instruct students to register their clicker in TritonEd. If you are not using TritonEd, instruct students to register their clicker on the iclicker.com website. For more information about how to integrate i>clicker with TritonEd, read these instructions. Interested in making a podcast of your course available? Learn more from Educational Technolgy Services: Podcast Your Course. If you need a desk copy of a textbook, please submit your request 3+ weeks before you need the book to allow for processing and shipping time. To request a desk copy, please complete the Desk Copy Request Form. Submit your course materials to the UC San Diego Bookstore ideally by the end of Week 3 of the previous quarter (deadlines established by Bookstore). The Textbook Department will accept all late submissions, but please note that they may be subject to publisher out-of-stock conditions and other factors that may cause delays. You can submit a Course Materials Request or a Textbook Adoption Submission Form (MS Word) to textbooks@ucsd.edu. Need to create a reader for your course? Submit a MyReader Inquirty & Order Form. TAs and Readers are asked to contact the Undergraduate Advisor to receive the text books for the courses they are employed. These books are strictly on loan and students will be asked to return the books at the end of the quarter. Course-related materials can be made available for students through the UCSD Libraries. Place items "on reserve" for a class such as: textbooks, journal articles, videos, book chapters, practice exams etc. If you submit a request and the library does not have the materials you are looking for, they will purchase the item for you. They will typical purchase one book per 50 students enrolled. In blink, under instruction tools, you can access your class list. You can also send messages to your class through this tool and see student photos. On Blink, go to the Instruction Tools tab located on the top navigation bar or in the Toolbox. Select Class Lists. You will be prompted to log-in through Single Sign-On. Under Options select "Download" for Class List. Please note there is a column for class list and another one for wait list. Make sure you select the correct option. The next screen will have several downloadable options. Use the default selection which is "Standard". Under "File type" select either PC-File or Mac_File. Submit Download. The class list will be downloaded as a rich-text file. Copy and paste all the information in to an EXCEL spreadsheet. If your setting are different the document might automatically download as an EXCEL spreadsheet. Steps to print a Class List: You also have the option of ONLY printing out your class list. Follow steps 1-4 from above. Then under Options select "Print Class Roster" for Class List and then click on the "Select Section" button right below. Please note there is a column for class list and another one for wait list. Make sure you select the correct option. On the next page there will be a link to print your class list. The list will be downloaded to your computer as a pdf document. You will need Adobe Acrobat Reader to view this information. Please note that we will not scan whole books. Per Copyright Policy we are able to scan up to 25% of a book. Please allow for 1-2 weeks turn around time. 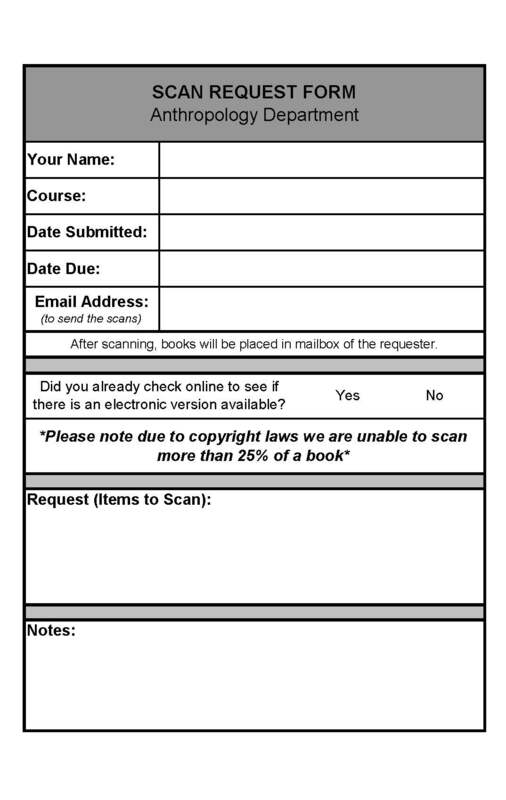 To request a department scan, complete the department scan request form and include with your book. The Office for Students with Disabilities works with students who have documented disabilities and determines what reasonable accommodations we must provide for these students. Students should bring the instructor and department offering the course an official Authorization for Accommodation form signed by the Office for Students with Disabilities, which describes the accommodations needed at the beginning of the quarter. Typically, students need additional time on exams and/or a quiet location to take the exam. The undergraduate advisors can help with administering these exams. Advisors, faculty and students will collaborate to plan for accommodations. Teaching Assistant: A teaching assistant (TA) assists in the instruction of an upper or lower division course at the University under the supervision of a faculty member. The TA primarily assists the faculty member in charge of the course by conducting discussion or laboratory sections that supplement faculty lectures and by grading assignments and examinations. A TA may also assist with the development of assignments or exams, hold office hours and proctor examinations. In the case of basic language, reading and composition, some other skills-building courses, and a few other courses, a teaching assistant may lead the class meetings, but as with all other TAs, the general instructional content of the course, as well as the official assignment of student grades and decisions on grade appeals, are the responsibility of the faculty member in charge of the course. In no instance shall a teaching assistant be assigned responsibility for the entire instruction of a course. Reader: A Reader assists a course instructor by grading homework, papers, or exams and may also hold office hours to answer students' questions about such assignments. Undergraduate Instructional Assistants (UIAs): UIA opportunities are available to undergraduate students who meet certain requirements. Students earn four units of upper-division credit with Pass/No Pass grading. The course is not counted toward minor or major requirements for students but they will receive credits. Students, under direction of instructor, lead discussion sections, attend lectures, review course readings, and meet regularly to prepare course materials and to evaluate examinations and papers. If you have a student interested in applying, please direct them to apply online and once they apply to notify anthroadvising@ucsd.edu. 2) Have all participants complete and sign the UC San Diego General Waiver form. Send all materials to Debbie Kelly (Department Safety Coordinator) and anthroadvising@ucsd.edu. For any questions or difficulty entering grades, please contact egrades directly. Final examinations may not be given at any time before examination week without explicit approval of EPC. Take home papers must to be due the date/time of the scheduled final exam. About Exams: Read about midterm exams, final exams, retention of exam papers and the processes that support exams. Instructors must retain exam papers for at least one full quarter after the exam period, unless the papers have been returned to the students. Using Scantrons? The scantron machine is located in the Anthropology Department mailroom. Please have your students use the 882-E green scantron and a wood pencil (not a mechanical pencil) so the machine will properly read the answers. Please do not direct students to submit paperwork in your mailbox. The mailroom is not an appropriate place for undergraduate students. Nor should you direct students to drop off exams in the front desk area. The drop box is conveniently located outside where students may drop off exams securely 24/7. Currently there is no time stamp, if this is an issue for your course, please let me know so we can discuss solutions. We will check the drop box every day during finals week, but if you have another assignment due at a different time in the quarter, please let me know when the due date so that the drop box can be checked. Rather than distributing final exams after your course is over, we offer an alternative to handing back your own exams - Final Exam Bins - where exams from the previous quarter may be retrieved 24 hours a day, 7 days a week by your students. Step 1: Provide your students with information about the Buckley Waiver and have them sign the waiver at the time of the exam. Advise them to pick up their exams from the 2th floor Final Exam Bins located between the administrative office and faculty office wing, by the elevator. Step 2: Once your exams are graded and the grades are recorded, give your exams that have signed Buckley Waivers to the Undergraduate Coordinators, all exams with a signed Buckley Waiver will be placed in one of the cubbies. Step 3: At the end of the quarter, exams from the previous quarter that have not been picked up will be shredded. Students sign the waiver that is printed on the back of the blue books purchase at the bookstore. Students may write “Buckley Waiver” at the top of their exam/paper and sign their name below these words. Embed the Buckley Waiver in your exam/paper. You can use the electronic copy of the Buckley Waiver or there are hard copies available in the mailroom. Students may be eligible to request an incomplete if circumstances beyond their control are preventing them from completing a class. The deadline for filing a request for an incomplete shall be no later than the first working day after final examination week and the student must be of non-failing quality at the time of the request. While in eGrades, enter the grade as "I" - a drop down box will appear where you can list the reason for the incomplete. The student must complete the work by the date given by the instructor (this date can be no later than the last day of the next quarter's finals, excluding Summer Session.) When you are ready to assign the final grade, simply sign in to eGrades and make a grade change. If the student does not complete the work, they will receive a permanent F, NP or U for the class. **Grade changes after one year will require students to submit an Undergraduate Petition that will need to be approved by the Academic Senate (EPC). Instructors and TA's should utilize the copy machine in the mailroom to make copies of exams. If you have any questions regarding copying or paper supplies, please see a staff member. eGrades is a secure web-based application that allows instructors to submit or change final grades for the students in their courses. Read for more information. Once grades for a section have been submitted, eGrades allows grade changes for that section for up to one year. Hours: Mon., Tues., Wed., Fri., 8 a.m. – 4:30 p.m. Thurs. 10 a.m. – 4:30 p.m.
them in room 190 of Galbraith Hall. Health System staff and faculty are encouraged to call HEAR at 858-657-6795 or 858-657-6799 or OPTUM Health at 1-866-808-6205, code UCSDMC. Can't find a book that you need at the library? Recommend a Purchase!